In the last blog post, I wrote about a common postural disparity called Upper Cross Syndrome (UCS) which involves a head-forward posture and scapular protraction. Upper Cross Syndrome is a muscle imbalance which includes a combination of overactive, shortened muscles and inhibited, lengthened muscles. We can visualize this by looking at a person from the side and picturing an X overlaying the body as illustrated in Fig. 1; one leg of the X indicates the overactive muscles (the posterior cervical extensors and pectoralis muscles) and another indicates the inhibited muscles (the lower and middle trapezius and rhomboids and the anterior cervical flexors). Also discussed in this post was the sinew channels (jingjin) involved in UCS. Specifically, the Lung and Large Intestine sinew channels were seen to work in a coordinated fashion to balance the scapula and were involved with imbalance as seen in scapular protraction. In protraction, the muscles of the Lung sinew channel (pectoralis minor) were short and overactive while the muscles of the Large Intestine sinew channel (the middle and lower trapezius) were inhibited. The Kidney and Urinary Bladder sinew channels work together to balance the cervical spine in relationship to flexion and extension. 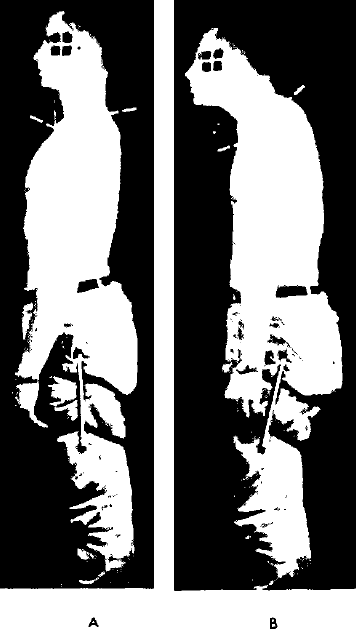 In a head forward posture, the muscles of the Urinary Bladder sinew channel (comprising the cervical extensors such as the splenius cervicis and capitis) were overactive while the muscles of the Kidney sinew channel (comprising the deep cervical flexors such as the longus colli and capitis) were inhibited. So, in terms of the sinew channels, the structures involved with UCS are Lung/Large Intestine and Kidney/Urinary Bladder. Interestingly, the zangfu pattern commonly seen with UCS parallels this, as seen in a study done by Matt Callison, M.S., L.Ac. Callison presented the finding of this study at the Pacific Symposium in November of 2011. He took a sample size of 150 (this has now grown to over 250) and had them fill out a questionnaire which included common questions asked as part of the examination methods in TCM. In addition, postural assessment was performed revealing five basic postural patterns. These are seen in Fig 2 below. Fig 2: Image courtesy of Matt Callison and used with permission. Type I indicates the Zang pattern associated with UCS. Other postures and their respective sinew channel relationships will be explored in other posts. 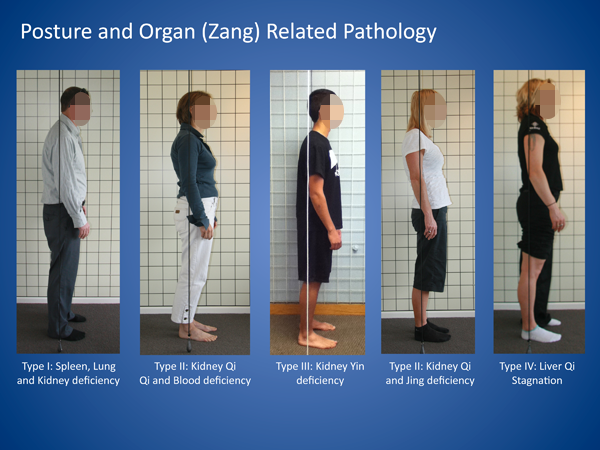 Matching the results from the questionnaire revealed trends that allowed a comparison between these five common postural disparities and common Zangfu diagnoses. Relevant to this discussion, respondents with UCS as seen in the first image in Fig 2 gave answers that would be consistent with Spleen, Lung and Kidney deficiency. Observing this posture, one can see the compression of the lungs which affects breathing, but also the middle jiao is compressed and there is a bowing of the abdomen. Kidney deficiency manifests with a reduction in tone of the stabilizing muscles of the spine, especially the cervical spine in UCS. Note: UCS involves the Lung and Kidney sinew channels and their respective internally and externally related channels. UCS describes a Western muscle imbalance, first discussed by Vladamir Janda. It is only describing the relationship of the shoulder girdle and the head/cervical balance. In practice, I see the Spleen sinew channel involved, as it incorporates the deep abdominal fascia which, when restricted, can contribute to a bowing of the abdomen. The question that often arises is that of chronology. Which came first: the posture or the pattern? In my opinion, this is a somewhat unimportant question; it is more useful simply to understand that structure and function are related. One affects the other. Possibly there is no answer to this question, as dysfunction occurs differently for everyone. Some may have zangfu dysfunction, which affects the channels and collaterals and leads to a change in the posture. Others may have a job or other circumstance that affects the posture and, due to the strain on the internal organs, leads to zangfu disharmony. What is more important to consider is that addressing the posture can impact the health of the zangfu. This will reinforce and broaden treatment with distal points in an acupuncture session, and with herbs, diet, and lifestyle changes. In the last post I discussed how a head-forward posture can, due to the additional load on the posterior cervical region, contribute to several injuries and orthopedic disorders. In this post, I will discuss a common relationship that a head-forward posture has with the shoulder girdle. The sinew channel relationship to this imbalance will also be discussed with the emphasis on the importance of assessing and treating this common pattern with acupuncture, tuina, and corrective exercises. In the next post, we will look at how this postural pattern relates to zangfu disharmony. Acupuncturists can greatly improve their results by recognizing and addressing this common postural imbalance when treating a wide range of conditions. Upper cross syndrome describes a common postural pattern first discussed by Vladamir Janda, a Czech physician. Janda described this common upper body muscle imbalance as an X with one leg of the X consisting of a group of overactive (locked-short)* muscles and the other consisting of a group of inhibited (locked-long) muscles. This common pattern is seen with a head-forward posture and scapular protraction. Pectoralis minor, highlighted in red, pulls in and down in the front. Lower and middle trapezius (and rhomboids), highlighted in blue, pulls in and down in the back. When maintaining a balanced tone, this stabilizes and balances the shoulder girdle. The common muscle imbalance seen is for the pectoralis minor (red) to be overactive and the middle and lower traps (blue) to be inhibited. The pectoralis minor is particularly important in its influence on scapular protraction as it has direct attachments to the scapula at the coracoid process. From the coracoid process, the pectoralis minor has an attachment to the 3rd, 4th, and 5th ribs. The fibers attaching to the 3rd rib have a relatively more horizontal fiber direction compared to the more vertical 5th rib attachment. This line of pull creates a medial rotation of the scapula, while the 5th rib attachment creates more of an anterior tilt. Scapular protraction often has components of both of these when the pectoralis minor is short. the pull of the pectoralis minor, highlighted in red. 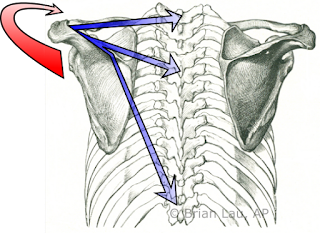 Balancing this line of pull is the lower and middle trapezius and the rhomboids. The lower trapezius balances the downward pull of the pectoralis minor while both the middle trapezius and rhomboids counter the movement of the scapula away from the midline. Both the lower and middle trapezius and the rhomboids have a tendency to become inhibited and fail to properly resist the pectoralis minor. 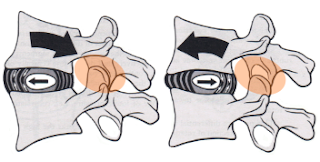 the connection of the LI sinew channel to the thoracic spine. For acupuncturists, it can be very informative to review the pathway for the Large Intestine and Lung sinew channels. The Large Intestine sinew channel expands the influence of the primary channel as it attaches to the thoracic spine. I believe this to include a continuous sequence of muscles and fascial structures which start with the first dorsal interosseus muscle (accessible at LI-3 and LI-4) and continuing up the arm to connect, via the middle and lower trapezius, to the thoracic spine. The Lung sinew channel begins at the thenar muscles and continues up the arm to connect, via the pectoralis minor, to the ribs. What this means is that the internally-externally related Lung and Large Intestine sinew channels work together to balance the shoulder girdle on the ribcage. When there is an imbalance between these two related channels, this is frequently seen with scapular protraction. However, upper cross syndrome also describes cervical muscle imbalance. This includes the overactive cervical extensors on the posterior neck and the inhibited cervical flexors on the anterior neck. These can also be seen as an imbalance between internally-externally related sinew channels. The Urinary Bladder sinew channel includes the posterior cervical muscles, while the Kidney sinew channel includes the deep anterior cervical muscles such as the longus colli and longus capitis. Even the pectoralis major can be seen to have a connection to the Urinary Bladder sinew channel. Through the thoracolumbar fascia, the Urinary Bladder sinew channel has a branch that I interpret as the latissimus dorsi. 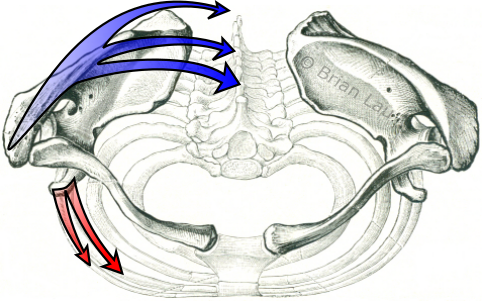 The latissimus dorsi attaches to the medial lip of the bicipital groove, in very close proximity to the attachment of the pectoralis major. However, classically the sinew channels are said to converge, and I believe the pectoralis major to be also part of the Heart sinew channel, so it is a region where the Urinary Bladder and Heart sinew channels converge. Also, there is a branch that attaches to the shoulder and connects with another area of convergence, the lower trapezius (this time converging with the LI sinew channel). In my view, both of these branches of the Urinary Bladder sinew channel (lats and lower traps) help explain how excessive pathological Yang can rise and contribute to tension manifesting in excess (overactivity) in the neck, shoulders and chest. It is helpful to review commentary about BL-60 Kunlun and understand that this point ‘Clears heat and lowers excess’. In addition it ‘pacifies wind and leads down excess’. This involves Liver disharmony with pathological Yang rising up the Urinary Bladder channel. This rising Yang often contributes to occipital headaches, neck pain, and shoulder pain. BL-10 Kunlun treats the manifestations of this rising Yang, often in combinations with SI-3 Houxi. Being a Jing-River point, it is an excellent point to relax the sinews, in this case associated with the Urinary Bladder sinew channel. BL-60 Kunlun is a useful distal point to treat the rising Yang activity which contributes to the imbalance discussed with UCS, but in order to fully take patients out of this dysfunctional pattern, it is necessary to treat locally. Acupuncture to motor points of the affected muscles (both inhibited and overactive) is a great strategy to reset dysfunctional muscle spindles and balance the internally-externally related channels. In addition, tuina/myofascial release and corrective exercises help increase the therapeutic results. UCS, therefore, offers fantastic insight into the coordinated balance between the sinew channels and common patterns of dysfunction that occur between internally-externally related channels. The Lung-Large Intestine sinew channels work together to balance the shoulder girdle, while the Urinary Bladder-Kidney sinew channels work together to balance the cervical spine. One of the most common postural disparities I see is a head-forward posture. In The Physiology of Joints, Volume III, French surgeon and anatomist Adalbert I. Kapandji states that for every inch the head goes forward it gains an additional ten pounds of weight in terms of strain on the posterior neck and upper back muscles. The average weight of the head is about 4.5-5 kg (10-11 pounds) and, in a balanced posture, it is supported evenly amid the muscles of the neck. 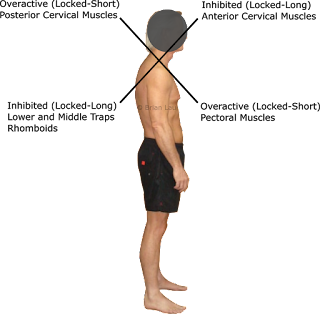 With a head-forward posture, this balanced support is disrupted, and the posterior neck and upper back muscles then become increasingly more overloaded (and painful) with every additional degree of head-forward posture. With the head an inch forward (neutral is considered as consisting of the ear aligning over the acromion process which is the highest point of the shoulder) this means that the posterior neck and upper back muscles have to support about 20 pounds of weight all day. At 2 inches forward, this becomes about 30 pounds. With Americans spending more and more time behind the wheel, in front of computer screens, glued to cell phones and tablets, and performing other activities which lend themselves to this already common posture, it is not surprising that we frequently see so many problems attributed to this posture. This is the first post of a three-part article about the implications of the head-forward posture. 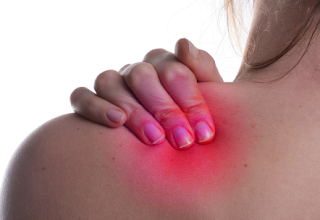 Part One (today’s post) discusses some common pain syndromes to which it contributes. Part Two will discuss the relationship of this imbalance to the shoulder girdle and will look at the sinew channel relationships. These two parts will be useful for patients and those suffering from the painful conditions described below; they will also be useful for acupuncturists who want to understand how improving posture can improve treatment results. Part Three will explore the relationship of this imbalance to the zangfu (primary organ systems discussed in TCM). This will be largely for the benefit of practitioners of acupuncture, tuina and other modalities used in Traditional Chinese Medicine. Generalized neck pain and shoulder pain caused from muscle overuse: As stated above, for every inch the head moves forward, it gains an additional 10 pounds of weight in terms of strain on the posterior neck and upper back muscles. What this means is that the muscles of the posterior cervical spine are working overtime, day in and day out, and for a prolonged time. It is just a matter of time before they start to cry out for some attention and that usually comes in the form of aches and pain. Specifically, the upper trapezius, levator scapula, and splenius cervicis are frequent muscular contributors to neck discomfort; they not only produce pain, but reduce range of motion and can contribute to stiffness, including stiffness which makes it difficult to turn the neck. Generally, restriction in the upper trapezius manifests in reduced range of motion and discomfort towards the end of the range of motion when looking in the opposite direction, while restriction in the levator scapula often causes pain when looking to the same direction. 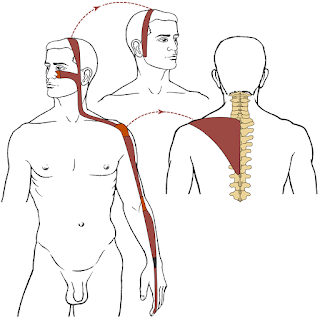 However, sometimes all three of these muscles can become spasmed, making it very difficult to turn the neck in any direction without considerable pain. And it is not just the muscles which are involved with neck pain from a head-forward posture. The strain in the posterior neck from the additional load signals fibroblasts to produce more extracellular matrix to support this area. Fibroblasts are specialized cells that produce the building blocks of fibrous connective tissue, such as collagen fibers and a sticky, syrupy substance called proteoglycans (a protein-carbohydrate based molecular structure). Prolonged strain (such as years of bracing against the extra weight of having the head forward) stimulates production of this extra material which can be easily felt as dense, ropy, fibrous bands in the upper back and neck region. It is the body’s attempt to add more support to a region that has additional demands placed on it. Local massage, acupuncture, or other treatments applied directly to the painful tissue may temporarily help make this dense, stagnant tissue feel better, but the posture as a whole needs to be addressed if there is to be any hope of long-lasting relief. 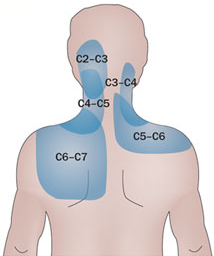 Cervical facet joint referral patterns. Facet joint syndrome: This involves a degeneration of the vertebral facet joints, which is usually secondary to degeneration of the intervertebral discs. Cervical disc degeneration is usually exaggerated whenever there is long term hypomobility (limited movement) of cervical spine. While the outer part of the intervertebral disc has a blood supply, the inner part does not and requires nutrition and fluids via diffusion from the outside. So, with any limited movement patterns that persist for a long time, the discs suffer. As one of my tai chi instructor states, “Motion is Lotion,” and this is definitely true for the spine. In addition to the discs, the synovial, freely moveable (at least they should be) joints of the spine can become degenerative and lead to pain, which can affect the neck but can also refer to the head and, even more commonly, between the shoulder blades. This is a commonly overlooked source of pain and patients with a head-forward posture are much more predisposed to it. Facets joints are the synovial joints between adjacent vertebrae. They can become degenerative and painful with osteoarthritis of the spine. 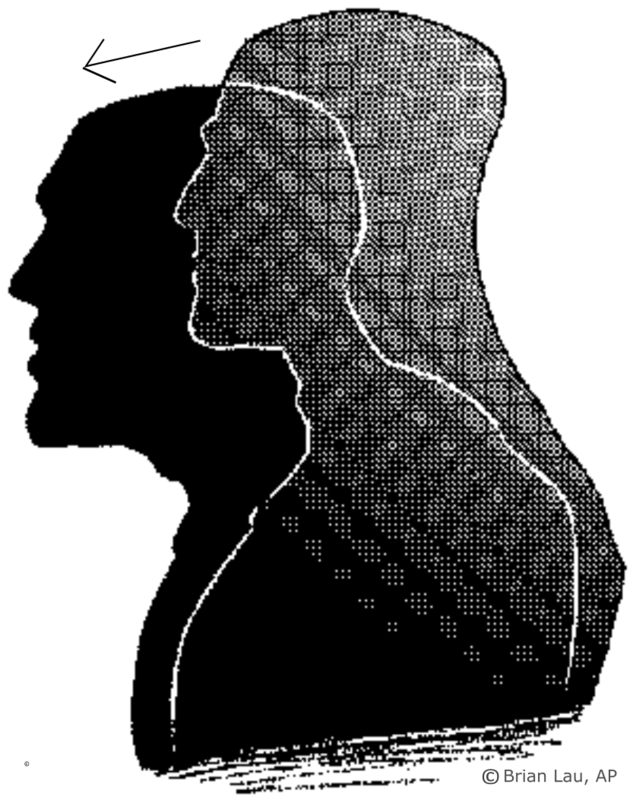 In a head forward posture, the upper cervical facets are often in a closed position while the lower facets are in an open unstable position. 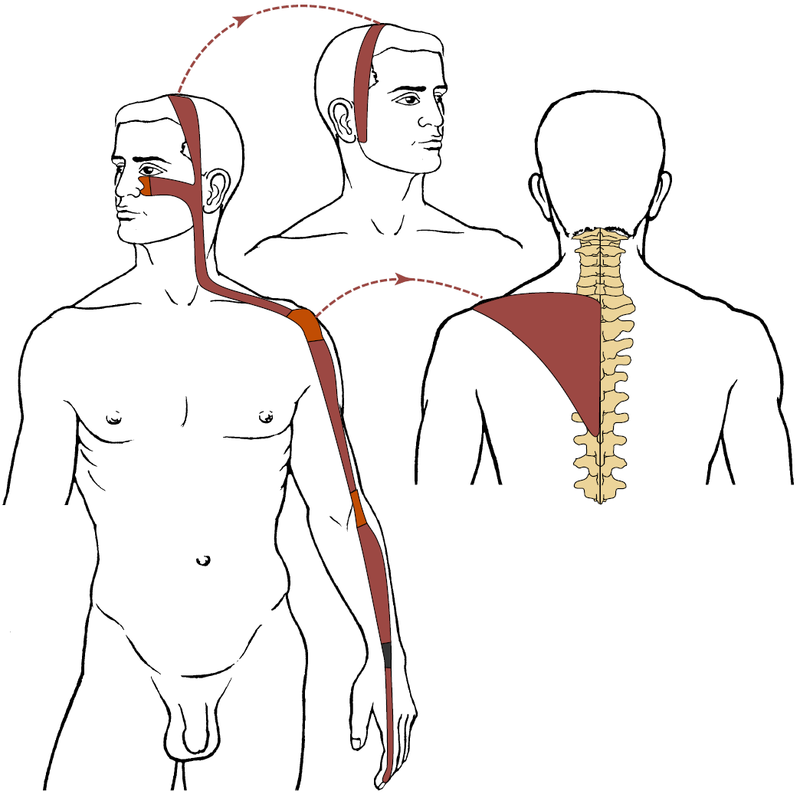 Both situations can aggravate the joints and lead to referred pain. This image is from Kapandji's Physiology of Joints. (at extrapoint Bailao) TrP referral patterns. Dyfunction: A Trigger Point Manual. Tension headaches: With cervical (neck) flexion and capital (head) extension, the posterior cervical muscles are in a shortened position, especially the muscles referred to as the suboccipitals. These four deep upper cervical muscles are very common causes of referred pain into the head, contributing to tension headaches. With the movement of the head forward, the eyes would be looking toward the ground if not for these muscles tightening to lift the head, placing the occiput into an extended position relative to the top of the cervical spine. Other muscles, such as the upper trapezius, splenius capitis, splenius cervicis, and sternocleidomastoid (SCM) are also negatively impacted and common contributors to tension headaches. Nerve impingements and entrapments: Since disc health is affected by head-forward posture, it can play a role in spinal nerve impingement. In addition, thoracic outlet syndrome (another type of entrapment of neural structures) is often seen with a head-forward posture. Both of these can radiate pain into the upper extremities and be causes of pain in the arms, elbows, forearms or hands. Thoracic outlet syndrome involves an entrapment of the brachial plexus, which is the bundle of nerves that exit from the neck and travel to the arms. The brachial plexus can be entrapped as it travels between the anterior and middle scalene muscles (two anterior neck muscles which are shortened in a forward-head posture), between the clavicle and ribcage, and between the pectoralis minor muscle and the ribcage. The head-forward posture is often a contributing factor to all of these, especially as the entire shoulder girdle is involved (more on this in the next post). Jaw tension: a head-forward posture places the mandible (lower jaw bone) in a position which stresses and tightens the muscles of the jaw. The position of the head places anterior neck muscles such as the suprahyoids and infrahyoids in an overstretched position. These muscles attach to the mandible and pull down on the lower jaw bone. The muscles of mastication (chewing), such as the masseter, reflexively tighten to hold the jaw close. They then develop trigger points which put pressure on the temporomandibular joint (TMJ). Shoulder and other problems: Part 2 of this post will discuss the relationship of the balance of the cervical spine to the shoulder girdle. Because these are so intimately tied to each other, shoulder dysfunction such as supraspinatus tendinopathy, bicipital tenosynovitis, infraspinatus and subscapularis myostrain, and other conditions are often made worse by the strain of a head-forward posture. As we explore the sinew channel relationship described in Chinese medicine, this neck-shoulder girdle relationship will become even more apparent. In addition to shoulder dysfunction, head-forward posture can contribute to other problems elsewhere in the body. This could become a very complex analysis, so I will not give a complete list. However, I will mention some interesting research that explored hamstring flexibility in relation to the suboccipital muscles (which extend the joint between the occiput and top of the cervical spine). This research measured hamstring flexibility and then split the subjects into two groups. Members of one group performed hamstring stretches; members of the other performed stretching to the suboccipital muscles. Surprisingly, the group that received stretching for the suboccipitals alone had a greater increase in hamstring flexibility (13%) than the group receiving hamstring stretches alone (9%). The reason likely has to do with the high concentration of muscle spindles present in the suboccipital muscles and, due to this, the fact that they have such a strong influence on tone throughout the musculature of the back, especially at the hip joint. Consider what happens when someone is startled, and the typical startle response observed. The firing of the suboccipitals might be reflexively tied to the firing of the hamstrings which assists in extending the hip joint. This, along with the shortening in the front of the body, would effectively protect the vulnerable organs.